HOT 97’s Who’s Next Live is back! Head out to SOB’s on Tuesday, August 20 to check out the best up-and-coming talent out there in the biggest monthly showcase for underground artists. This month, 360 & Dyme-A-Duzin hit the legendary SOB’s stage, joined by Yungstar 6’3, Bishop Nehru and AK-69! Hosted by HOT 97’s very own Peter Rosenberg and Shani Kulture with music by DJ Juanyto, HOT 97’s Who’s Next Live is the place to be seen by industry bigwigs and music trendsetters. Hailing from Queens, 360 is on the rise in the Hip Hop world. Working with everyone from Jadakiss, Freddie Gibbs, Waka Flocka, and Wyclef Jean, and the world premiere of “Own Thing” from HOT 97’s Funk Flex, has helped 360 become one of the most-talked about newcomers in Hip Hop! Also hitting the stage is Dyme-A-Duzin, representing Brooklyn. Named one of Complex’s “10 NY Rappers to Watch Out For” in 2012, and featured on Rosenberg’s 2013 mixtape “New York Renaissance”, Dyme-A-Duzin is making news all over the Hip Hop scene. He takes the stage at HOT 97’s Who’s Next Live withYungstar 6’3, known for his work with legendary DJ Chuck Chillout and mixtape series “Informal Introduction”, Bishop Nehru, who was recently featured on Aaron LaCrate’s latest mixtape, “Appalled,” which is quickly becoming a hot topic in the press, and AK-69, the Japanese-native Hip Hop artist whose single was nominated in 2011 for Best Hip Hop Music Video in the MTV Music Aid Japan. Purchase your ticket today to check out the hottest emerging talent in Hip Hop! 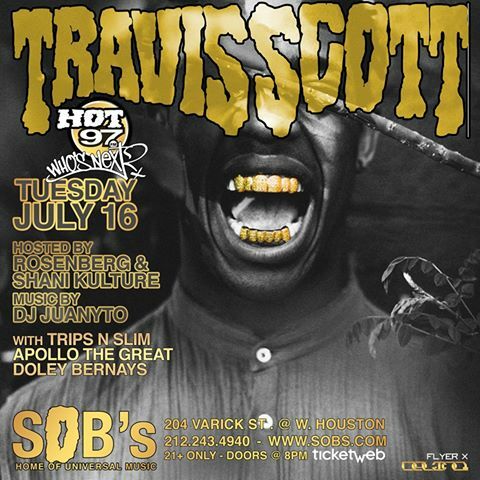 Who’s Next Live takes place at SOB’s located at 204 Varick St. New York, NY. Doors open at 8 p.m. and show starts promptly at 9 p.m. (21 and over, identification will be asked upon entering the venue). Tickets for the show can be purchased here. 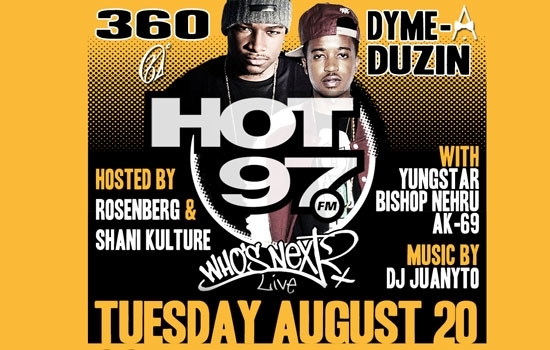 For more information on HOT 97’s Who’s Next Live visit HOT97.com.